The ECC83 Valve – also known as the 12AX7. The 12AX7 Valve (or 12AX7 vacuum Tube) is a small preamplifier valve which is identical to the ECC83 – same valve, just a different name. It has two identical triodes both of which have a high voltage gain. It is used in 99% of all guitar amplifiers. RCA engineers developed it around 1946 and released it for sale as the 12AX7 shortly after. Because it provides two handy amplifiers in one miniature glass envelope, the 12AX7 valve is still a much used and popular valve. In fact, it is one of the few small-signal vacuum tubes in continuous production since it was introduced. ECC83 Valves (12AX7) valves for sale. Brand new and fully tested. Note: We are one of the leading sellers of ECC83 valves. We ship internationally every single day so you can buy with confidence. All valves fully tested and 100% guaranteed. You can buy ECC83 valves here. The reason this valve is used so much is that it’s actually two identical valves in one envelope! So designers can get two gain stages using just one valve. Designers find this very useful as it cuts down dramatically on the space needed within the amplifier. You would need a dozen or more valves in the average guitar amplifier if you didn’t have these two valves in one package. In technical terms, this valve is a “dual high gain triode”. Let’s look at that in more detail. ‘High Gain’ – speaks for itself. The gain is about x100 although in practice a workable gain of 60 is achievable. ‘Triode’ – the ‘ode’ part refers to the electrode. So each valve has 3 electrodes. A Cathode, an Anode, and a Grid. So how on earth do they pack all that into one 9-pin envelope? 6 pins are taken up by the cathodes, anodes, and grids. But each valve also has a heater, so that would need another 4 pins. 6+4=10 and we only have 9 pins! So in this valve, they put the heaters in series and bring out the two ends and a centre tap. Neat – and only 9 pins. You can put 12V across both heaters, or 6V across the individual heaters and ground the centre tap. 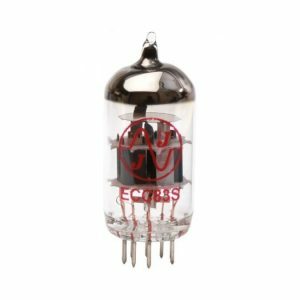 What is the difference between a 12AX7 Valve and an ECC83 valve? The answer is simple – there is not the slightest difference between these two valves. They are identical. They only differ in name. Confusing, but there it is! One (12AX7) is the American designator and the other (ECC83) is the British. If you own a valve guitar amplifier it is highly likely to have at least one 12AX7 (ECC83) in it. The preamplifier guitar amplifier valves take the very low-level signal from your guitar and amplify it up in several stages. For reasons I won’t bore you with, you can only get a certain amount of gain from a single valve stage. So you need to cascade several guitar amplifier valves to get the gain we need. This is where it’s very handy to have two separate amplifiers (triodes) in each envelope. So you get two stages of gain for the price of one! The ECC83/12AX7 is a Pre-amplifier Valve Only. Because this valve has a lowish current capability, you can’t use it to drive the speakers. For that, you need bigger, beefier power valves. These smaller valves are confined to the early stages of your amplifier where they boost low-level signals to useable levels. A typical valve guitar amplifier will have between 3 and 6 preamplifier valves and these are almost always 12AX7 (ECC83) valves. Occasionally you will find an ECC82 or ECC81 used as a pre-amplifying valve. These are actually quite different in characteristics to the ECC83. However the ECC81 and ECC82 they have a lower gain and are so designers sometimes use them instead. So now you know. There is no difference between a 12AX7 valve and an ECC83. If you would like to purchase 12AX7 (ECC83) valves please click below. ← Cathode Bias – What Exactly is it? 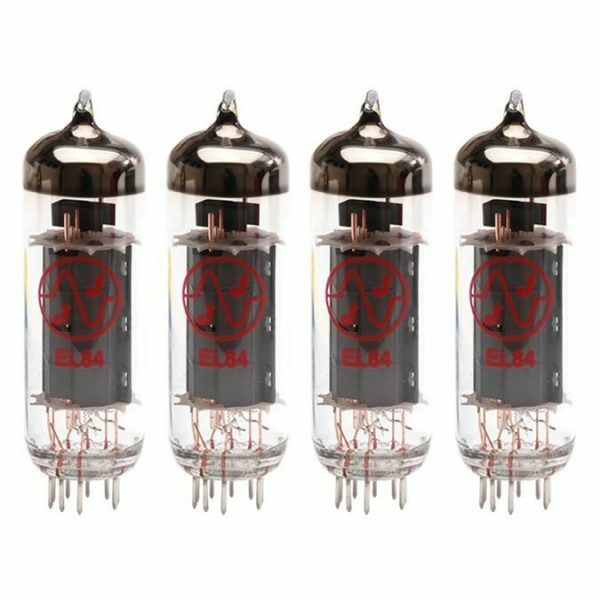 Is there a higher gain drop in replacement for the 12AX7 / ECC83? Hi Andy No the gain is the same. If you want a gain drop (eg to tame the gain) substitute a 12AY7 for the ECC83. See my blog on this. What I found is the 12AX7 had a heater resistance = 16 ohms (each) the ECC83 was 6 ohms, a considerable difference. This is trouble when the heaters are wired in series, for example Peavey amps sometimes, you’d better be sure the valves are similar enough that one doesn’t get all the power. It’ll glow bright yellow if it does & maybe burn out quickly. So it’s best to change ALL the preamp tubes for ECC83 and not just one.